The OMNI TRANSFORMER is our strongest most versatile hitch. 66lbs of steel MIG Welded into a one piece beast! 1/2" plate, angle and flat stock and 3/16" tubing used throughout. 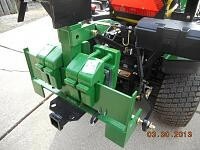 Unique wrap around lower link mounts assures there will be no separation of the hitch and your tractor. Hardened Grade 8 - 3/4" bolts are used to connect our stable of attachments. What other hitch will allow you to use standard 2" receiver mounts, and our middlebuster, ripper, log skidder plate, tool bed/carry all, lifting boom, weight rack and gooseneck ball ? We challenge you to find a better built hitch! We sandblast and then apply 1 coat of primer and 2 coats of implement enamel in Gloss Black, Kubota Orange & John Deere Green. Trailer Receiver and all attachments are painted gloss black. This item includes one Transformer platform, one trailer hitch receiver, two 3/4" Grade 8 bolts-nuts-washers, two 7/8" Category One Lower Link Pins, One 3/4" Top Link Pin, three 7/16" Lynch pins and one 5/8" Bent Pin. Some pictures show other OMNI Products and they ARE NOT included in this sale. Do you have a suggestion how we might improve this product? An idea for another attachment? If so send us an email and if we use it we will build one for FREE! This is a high quality fabrication with excellent design characteristics. Very heavy duty and well thought out. I had them weld the lower receiver on rather than the bolts which they accommodated without hesitation. I use it on a John Deere 1025R with 8 weights and can put the weights inside or outside the hitch with no problems either way. I would highly recommend these guys based on my purchase. Works as designed and with several attachments you can do just about anything. I use the transformer with skidder plate and log boom to move logs for my mill. Could not ask for a better set up. Fast shipping and great customer service to boot!! Yes, I comparison shopped, yes I agonized over this purchase. Yes, I could not be more satisfied. Rugged, well constructed and beautiful finish, the transformer with weight rack made a huge difference for my Kubota BX when plowing snow and loaded up with 8 suitcase weights. This was a fantastic purchase and the unit is so versatile. I got it with the carry all, fantastic combination. Now my saw, ropes and chain and tools are with me when I need them. Great purchase! The transformer platform and integrated rack quality, construction, and versatility is excellent!!! The steel thickness and weld quality make this system extremely rugged, and I expect it will last my lifetime. Shipping was very timely! I am extremely pleased that OMNI was willing to make modifications to the integrated rack for me which includes (3) 9/16" vertical slots each side of the platform center post. This customization adds versatility to the rack and allows me to carry numerous choker cables and chains at a handy location when using my tractor for skidding logs. The modifications do not affect the ability of the product as designed to carry suitcase style weights. If you combine: 1. The transformer platform and integrated rack with welded center chain hook with 2. A three point lift station or 3. log boom attachment you end up with a very versatile log skidding setup having multiple lift and hitch points. Not only do I now have the ability to skid multiple logs safely to a woods landing with my compact tractor, I also maintain the ability to tow a firewood trailer or splitter around without changing my skidding setup. The pricing of the platform and attachments compared to other products on the market seemed most reasonable to me when considering the high quality workmanship and this product's versatility.